MILWAUKEE, Wisconsin -- Some people bring emotional support dogs with them on airplanes to help calm their nerves. Carla Fitzgerald brings a duck. 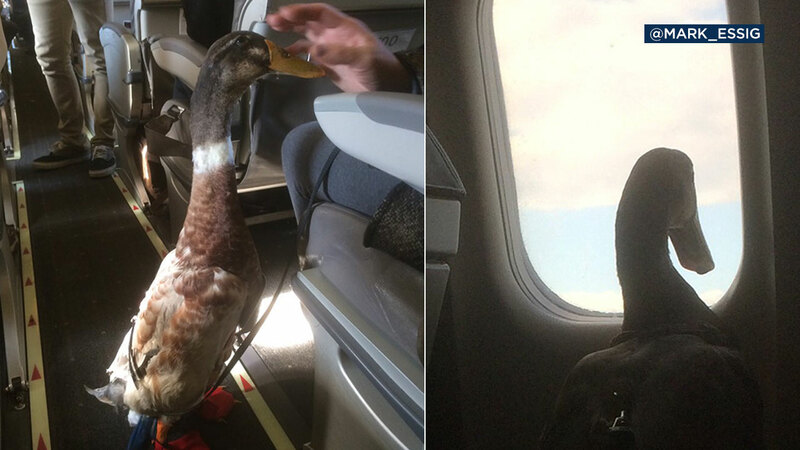 Daniel the duck recently took a trip with Carla on a flight from Milwaukee to Charlotte, N.C. and then to Asheville. Other passengers tweeted that Daniel was a big hit during the flight. He wagged his tail and quacked quietly to help keep Carla calm. She suffers from PTSD after a serious accident in 2013. She was driving a horse and carriage around Milwaukee when she was struck by a driver who was texting on her phone. Carla was thrown from her carriage and it took her months to walk again and regain use of her arm. Her doctor prescribed Daniel as a therapy animal when he appeared to have a calming effect on her, especially when he senses a panic attack coming on.